In recent years, major debates have emerged about the societal impact of video games and the effect they have on the people who play them. Among the disputes: whether men predominate in gaming; whether games portray women and minorities poorly; whether violent games promote aggressive behavior; and whether games encourage positive attributes such as problem-solving skills, communication and teamwork. A majority of American adults (60%) believe that most people who play video games are men – a view that is shared by 57% of women who themselves play video games. But the data illustrates that in some ways this assumption is wrong: A nearly identical share of men and women report ever playing video games (50% of men and 48% of women). However, men are more than twice as likely as women to call themselves “gamers” (15% vs. 6%). And among those ages 18 to 29, 33% of men say the term “gamer” describes them well, more than three times the proportion of young women (9%) who say the same. Americans are relatively divided over whether there is a possible link between violent games and actual violence. A slight majority of the public (53%) disagree with the statement “people who play violent video games are more likely to be violent themselves.” But 40% agree that there is a relationship between video game violence and violent behavior. Some 32% of those who play video games themselves see a connection between games and violence, along with 26% of self-identified gamers. Women are more likely than men to agree (by a 47% to 31% margin) that people who play violent games are more likely to be violent themselves. The public is closely split on some other major debates surrounding the content of games and their impact on users. For instance, a quarter of all adults (26%) think most video games are a waste of time, while 24% think most games are not a waste of time. One-third think some games are a waste of time while others are not. And 16% of the public is unsure what to think about this issue. A similar pattern is evident on the question of whether or not “most games help develop good problem solving and strategic thinking skills.” Some 17% of adults think this is true of most games, while 16% think this is not true of most games. Additionally, 47% think this is true of some games but not others, and 20% are not sure. Asked whether games promote teamwork and communication, 23% of adults do not think most games promote these traits – more than double the 10% who think most games do promote these qualities. Some 37% think some games but not others promote teamwork and communication, while 28% say they are unsure. Similarly, 30% of adults do not think most games are a better form of entertainment than TV, almost triple the 11% who think this is true. The public is much less certain on other aspects of gaming. Fully 47% of all adults are unsure if most video games portray minorities poorly, while 40% are unsure if most video games portray women poorly. 25% of those who play games (and 39% of self-identified gamers) think most video games help develop good problem solving and strategic thinking skills, compared with just 8% of those who do not play games. 17% of those who play video games (and 34% of those who call themselves gamers) think most games are a better form of entertainment than TV. This compares with just 5% of those who do not play games. 15% of video game players (and 28% of self-described gamers) think most games promote teamwork and communication. Just 6% of those without gaming experience agree. 35% of those who play video games (and 53% of those who identify as gamers) think most games are not a waste of time. 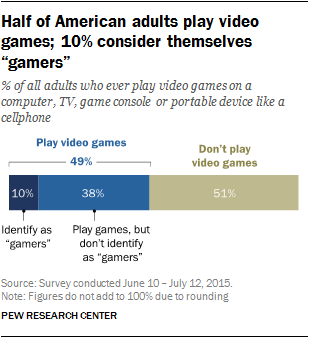 This compares with just 13% of those who do not play video games. 33% of those who play video games (and 46% of self-described gamers) do not think minorities are portrayed poorly in most games. 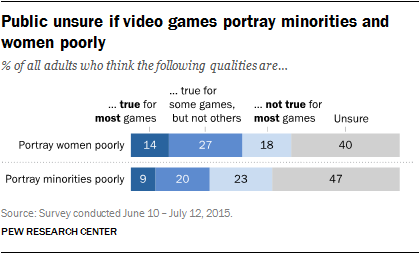 At the same time, 9% of game players (and 10% of gamers) think most games do portray minorities poorly. Fully 61% of those who do not play video games are unsure what to think on this issue. 26% of those who play video games (and 35% of self-identified gamers) do not think women are portrayed poorly in most games. Meanwhile, 16% of game players (and 24% of self-identified gamers) think most games do portray women poorly. 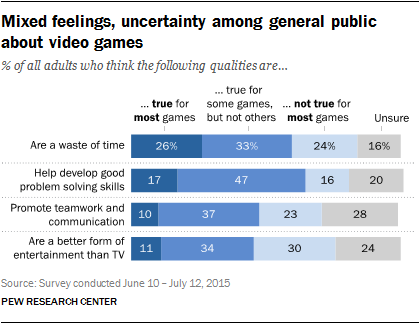 A majority of those who do not play video games (55%) are unsure what to think on this topic. Video: Who plays video games in America?